Check out BRII program statistics and the abstracts of BRII-funded authors in our 2008-2016 BRII Bibliography. 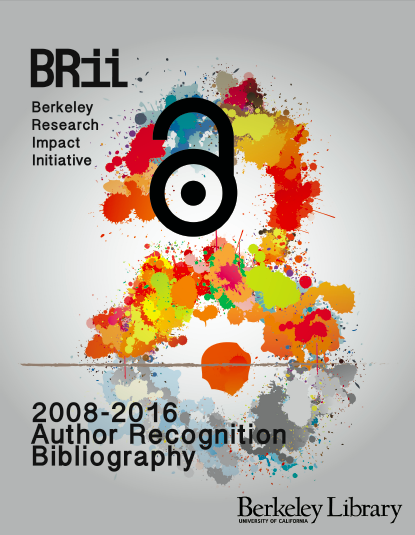 The Berkeley Research Impact Initiative (BRII) provides funding to Berkeley authors (current faculty members, post-docs, graduate students, researchers) and publishers (Centers, Organized Research Units, and Departments) to make their publications free to all readers immediately upon publication. The purpose of the BRII program is to foster broad public access to the work of Berkeley scholars by encouraging the Berkeley community to take advantage of open access (OA) publishing opportunities--including OA journals and journal articles, scholarly books (called “monographs”) and book chapters. Open Access literature is free, digital, and available to anyone online. With barrier-free access, researchers from anywhere in the world can read the scholarly output of Berkeley authors. This can promote progress and knowledge and, with the opportunity for greater readership, OA can increase the impact of Berkeley scholarship. The BRII program started in 2008 by redirecting a small amount of collections funds (that is, monies that are normally spent on books, journal subscriptions and other library materials) towards this initiative, and is supplemented with gift funds. There is a limited pool of money in the BRII program;should BRII funding be depleted during the course of the year, the program will be suspended for the remainder of the year or until further notice. The BRII program encourages applicants from all disciplines and departments, as well as Berkeley-based publishers of OA books and journals. Graduate students and assistant faculty are also encouraged to apply. If you (or your research lab) have secured grant funding, please use those funds to pay your article or scholarly book processing charges.